“Do you know why girls come to a futsal game?” whispered my friend, Nat. “It’s to see their crushes". I have liked him for two years now. And I am always a shy person. This is the first time that I come to a futsal game. As a girl, I do not like soccer, more so futsal. So I never see a point why I should come to a futsal game between the junior and the senior. I have a crush. A heavy crush, because I have liked him for two years now. I am always a shy person, so I never really talk with him. Only once when I first met him, when I was still a freshman. Shouted some girls that are already inside the court. I will never be that kind of girls. Being surrounded by guys, wearing heels and skirt everyday, their nails also perfectly done. They can talk to the guys easily, have pretty laugh, and know how to flirt. In short: pretty, friendly, and popular. But, why are they wearing heels to a futsal game anyway? “Hey, girls,” said Dean to us while coming out from the court. Liu is behind him. “Hi,” answer me coolly. “You look good in futsal clothes!” Dean and Liu are my best friends, beside Nat. They both spend almost every second of their life to play game, so it is rare to see them doing sport. “Yes, finally wearing this shirt to actually play sport, not just when I watch a soccer match,” said Liu. “Liv, you should be ashamed to call this ‘futsal clothes’. You really don’t know anything about sport,” said Dean. “Yeah, like you guys do sport in real life, not game,” said Natalie while giving Dean a towel and a shirt. This is the real reason why we come to the futsal game, because Dean forgot to bring a towel and a shirt. My eyes are wandering to the court. Looking for a certain person with a black hair and an olive colored skin. I saw him. He is the one with the light blue T-shirt. His face is sweaty, I think he already played a little before the match starts. “Well, I think the guys in our year is pretty good at sport. Better than senior,” answer Liu. “Yes, especially….” Dean is looking at me. “The one that Olive keeps looking at,” whisper Dean while Nat and Liu are just smirking. “You should stay until the match is finish. At least just to see him play,” suggest Liu. “And like him even more?” said me. “You’ve liked him for two years! You will like him for the rest of your high school life,” said Dean. “Sssshhh! Too loud!” I punch Dean on his arm. “You should be loud. So he knows that you like him,” whispered Dean. I am always a shy person. The first time I talk to Alvin was during chemistry class when we were still in our first month of high school. At that time, the only person that I had talked to is Natalie. That was also because she approached me first. One day, Natalie did not come to class. So I was just by myself, in the middle of class, while everybody around me were laughing and talking. I wanted to hide myself by putting my earphone and conceal the noises. But I was afraid that people will think I am an unsociable person. Suddenly my phone rang, I got a message from Nat. “That’s the sound of lightsaber right?” suddenly the guy that sat next to me talked to me. “You like Star Wars? I like it too!” said him cheerfully. And that was the moment when I fell for Alvin. “Liu! Dean!” Alvin is calling from the court. The match will start. “We will stay to cheer you guys,” said me. “Good luck!” I give high-five to both of them. “I will just hope you guys are not gonna be an embarrassment,” said Nat while giving a high-five. The match has started for five minutes. Liu just gets called out, and he is being substituted by Dean. “You did good!” said me, to cheer up that almost-die face. “For someone who only plays game, you did good,” said Nat. “Thanks? For that half heartedly compliment,” said Liu. Our eyes suddenly looking at the girls in senior team. They are distributing mineral water and towel. I put a coin into the vending machine. I am thinking about whether I should buy some snacks too. I do not understand futsal and Alvin has not played yet, so it is a little bit boring. I turn my head to the left, and my heart jumps. Alvin is right next to me, smiling widely. Classic Olive when her crush suddenly talks to her: nervous, stiff, mind is blank, short answer, not smiling at all, have I mentioned ‘stiff’?, and so nervous that she accidentally drops the coin. In my head, I scream: YOU ARE SO NOT COOL, OLIVEEE!!!! I quickly bend down to pick the coin, but I forget that my coin purse is still open. So, guess what, all of the coins inside fall down. I am so embarrassed, I want to put my head inside a hole. “Yes! You are pretty stupid!” said Alvin, while laughing louder. He has a nice laugh sound. I bought three bottles of mineral water (the other one for Dean) and two chocolate snacks (if I did not buy for Nat too, she will be mad). Alvin is waiting for me until I finish buying everything, and we walk together to the court. Should I talk to him about something? But what? My mind stops working, so I can not really think of anything. “Good luck for the game,” I said it before he gets to the court. It has been two years since I saw him smiling to me. This is what makes me fall for him. A really beautiful smile. He has a really, I do not know how to describe it, kind? Nice? Soft….? Maybe? He has a really soft smile. And he has a really cheerful laugh too. And he is kind too. And…. There are just so many things I like about him. And surprisingly he still remembers my name. Liu and Nat welcome me with a shock face. “Keep your cool,” I said it, threatening them. “What are you guys talking about?” ask Nat. “I am so happy I may cry. Finally after two years, you finally fu*king talk to him,” said Liu. The moment Alvin steps into the court, all the people in my years are cheering. Liu also screaming loudly. While Nat and me are just clapping. I do not know that he is that good. I do not understand futsal, but I can see that he is better than other players. He is faster, and more agile. Crap, I like him even more. He is so cool. Alvin is the type of guy that is always cheerful and smiling. So to see him being serious like this, I can not take my eyes off of him. All of a sudden, his eyes suddenly meet my eyes. The keeper throws the ball as far away as he can, and all of the players are chasing it, but in those some miliseconds, his eyes still only looking at me. Unconciously, I turn my head, avoiding his eyes. “I don’t know.” I will just pretend that I turn my head because I need to talk with Nat. I look at the game again. Alvin is looking so intensely at the ball right now. Four or five people is fighting to get the ball, but eventually Alvin manages to steal it. “Alvin is really good at playing soccer,” said a girl that sits near us, Lisa. “Yes. He becomes cool like that. He has no girlfriend, right?” asked the girl next to Lisa, Agnes. Liu and Nat is looking at me. “Congratulation! Although you guys didn’t score any goal. But you did participate!” said Nat, congratulate Liu and Dean for the win of the junior team. She should congratulate Alvin instead, all the two goals are scored by him. “If you want to congratulate us, please be more earnest,” said Dean. “Thank God, we have Alvin,” said Liu. “Yes, that guy is just in another level,” praised Dean. “Olive!” suddenly Alvin is already behind me. “Our hero of today!” shouted Liu. “The king of goals!” shouted Dean. “Congratulation for the goals!” said Nat. “Congrats for the win,” said me. “Thank you guys,” said him. “Where did you learn to play soccer? You should be in a professional team!” said Nat. “Ah, I don’t think I am professional level yet. It’s just because all of my family plays soccer,” said Alvin. “Alvin, if there is no me, there is no way we will win, right?” asked Dean. “Eh, I don’t know, what did you do?” asked Alvin. “Nah, I am kidding, Dean,” said Alvin while patting Dean’s back. “Me? How about me? Nat thinks that we are just there to fill the lack of players,” asked Liu. “But you did only play for five minutes,” said Alvin. We laugh so hard at Alvin’s response. “You, girls, don’t even understand futsal, you are not allowed to laugh!” said Liu. “But anybody knows that you played only five minutes, and your face already death tired,” said me. “Yes, laugh all you want. I may not good at futsal, but I am really good at playing FIFA,” said Liu. “Ah! Olive,” Alvin called my name. “I want to pay you back for the water,” said Alvin while opening up his wallet. “It’s OK! It’s only one euro something,” refused me. “Ah, you don’t need to feel bad. It’s just water. Thank you for the offer,” said me. “What? Nat can send me home,” said me. “Your house is in opposite direction from my house. I don’t want to. Beside, I need to go home early,” answered Nat. “I can send you home. But I need to take shower first, I am sweating a lot,” said Alvin. I punch Liu before he can finish his sentence. “So, would you mind to wait for me, Olive?” asked Alvin. “Ah, yes, thank you!” said me. I do not know what else to say beside ‘thank you’. “I am going to take shower first,” Alvin is going to the changing room. I am looking at my best friends. The first time I met Nat, I am offended by her because she said I am a coward. But now, I love her because she is a really honest person. When I met Liu for the first time, I thought he is an unfriendly person. But it turns out, we both like Superhero and we have a lot of similarity. I knew Dean, from Liu. My first impression was that he is a typical insensitive guy. But after getting to know him more, he actually cares a lot about his friends. “Thank you guys,” I said while smiling. “I know you will forever never can do it by yourself,” said Dean. “Finally! After two years, there is a progress!” said Liu. “Now, you need to promise us that you will not remain quiet. You need to make conversation!” said Nat. “Wait! What should I talk about with him?” I panick. 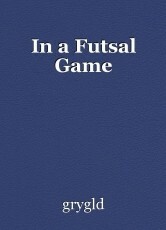 “I don’t know anything about futsal!” said me. “Something general, small talk,” suggested Dean. “Wait! I am looking at Google right now, ‘what to talk about with crush’,” said Nat. “Talk about Mr. Lindt, he is so annoying last week,” suggested Dean. “Mr.Lindt, you mean the calculus teacher?” asked me. Mr. Lindt? What? Why? “What? It’s a general topic. Everybody hates Mr. Lindt,” said Dean. “So, Google said, you need to relax before talking to him. So, RELAX GUYS!” shouted Nat. “Nat! I think you’re the one who should relax!” said Liu. I have liked Alvin for almost two years. And tonight, will be the first time I spend a long time with him, just the two of us. I do not think it will turn out well, because I am really shy and my mind goes blank everytime I am around him. But whatever happens, I am gonna be alright, because I have three best friends who will always be there for me. © Copyright 2019 grygld. All rights reserved. final part of "Too many drinks"